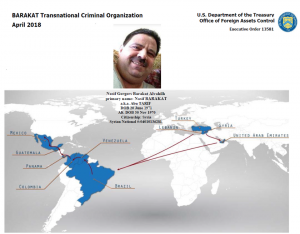 Feds Expose Network That Smuggled Illegal Aliens From Syria Through Mexico To The U.S. Authorities said the sanctions will freeze the syndicate’s assets, which should undermine the smuggling operation. The case has been pursued by the Treasury Department, Homeland Security and the Justice Department. Mr. Barakat, who also goes by the name Abu Tarif and lists two dates of birth in 1970 and 1971, was based in Homs.